Clicking it let's you apply a filter to the list below. You can filter a list to only see items from a specific category, with specific labels or with a specific priority level etc. You can also filter out recurring tasks or only see tasks that have a specific time in their title (e.g. "8am drink water"). You can also create custom filters with Smart Lists and then apply that filter to any list. For example let's say you are in the Master List and want to only see tasks that are due in the next 20 days. 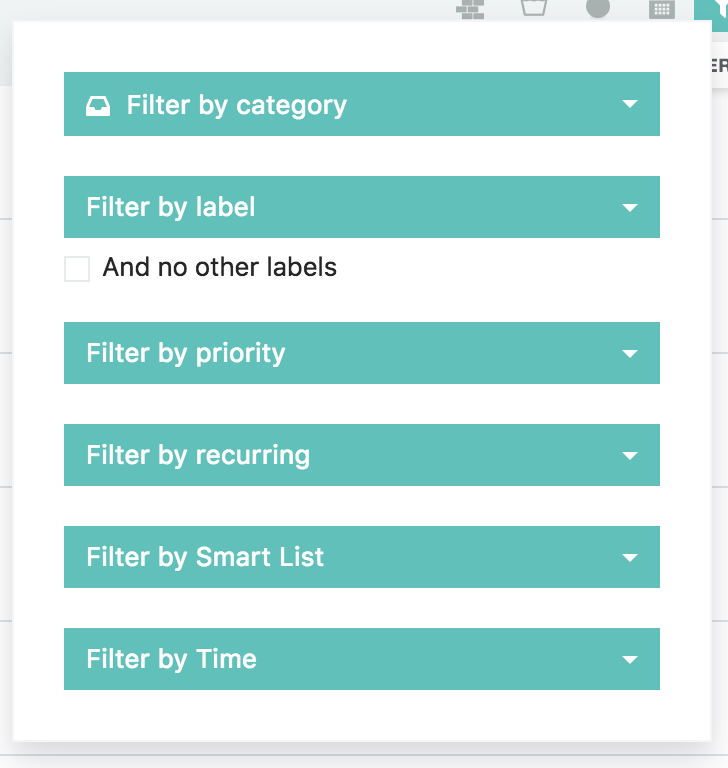 You would create a Smart List that includes anything due within 20 days and then select that Smart List by clicking on the filter icon and then the "Filter by Smart List" option. You can remove a filter by clicking the little x on the filter tag that appears on the left. You can quickly filter your day list by section when clicking the name of the section. Similarly, if you hold shift and click a label or context of a task in the day view the list gets filtered by that label or context.